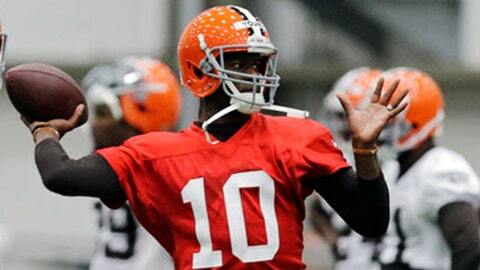 Cleveland Browns quarterback Vince Young (10) passes during a voluntary minicamp workout. The Vince Young era in Cleveland is over — barely after it started. It lasted all of 12 days as the Browns released Young along with quarterback Alex Tanney, defensive lineman Brian Sanford, defensive back Brandon Hughes and running backs Fozzy Whittaker. The moves were announced by the Browns Monday. Young was signed after the veteran minicamp prior to the draft along with quarterback Tyler Thigpen. The Browns have four quarterbacks on their roster with Brian Hoyer, Johnny Manziel, Thigpen and Connor Shaw, who was an undrafted rookie free agent signee from South Carolina. The Browns haven’t announced the signings of the rookie undrafted free agents. Young, 30, has not played in an NFL game since 2011 but had been in training camp as recently as last season with the Packers, but did not make the team. He was the third overall pick of the 2006 NFL Draft by the Titans and was named to two Pro Bowls (after the 2006 and ’09 seasons) with the Titans. 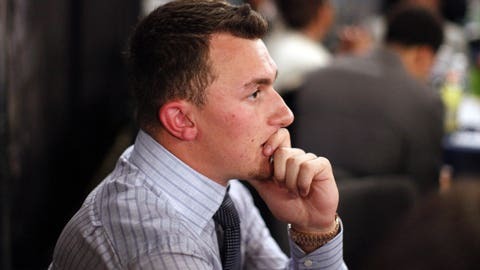 Why did Johnny Manziel tell his agent they were "screwed" during the draft's first round? In 2011, he spent time with the Philadelphia Eagles. He owns a 31-19 (.620) record as a starting quarterback in the NFL, passing for 8,964 yards and 46 touchdowns while rushing for 1,459 yards and 12 scores. Young was named the 2006 AP NFL Offensive Rookie of the Year, and in 2007 led the Titans to a Wild Card berth. Young was grateful to get another opportunity to play in the NFL after not catching on with the Packers and Bills in the past two seasons. "It’s a blessing," he said after the Browns signed him. "Right now, I am going to take stepping stones to make the team and put my nose down and keep working." Young was hoping to be able to resurrect his career with the Browns. After signing with the Browns, he said he canceled his flight home to show the Browns how serious he was about making the team. "The message is being told to the team I want to be here with the Browns," he said. "I have always had a tremendous amount of confidence in myself. "A lot of people don’t know behind the scenes I have been putting in a lot of work," he said. "I want to continue to keep fighting I want to be ready and am happy I stayed on task." Mike Pettine said Young showed flashes of brilliance completing a long pass during camp. "I joked with him that the rust was falling off in chunks," Pettine said. "But he flashed a couple of times out there." Young said he felt a bit rusty during the minicamp, but felt he still had it. "There were a couple of times this week, but there was definitely some rust on me." Tanney was signed off of the Cowboys practice squad during the 2013 season but never appeared in an NFL game. Whittaker rushed 28 times for 79 yards and caught 21 passes for 155 yards, including two touchdowns. He had 23 kickoff returns for 482 yards, including a long of 56 yards. Sanford was a defensive lineman reserve and Hughes was a defensive back signed during the 2014 offseason.